The sweetness and earthiness of parsnips are perfect for fall and the LeGoût® Cream Soup Base creates a consistent, creamy soup every time. Preheat oven to 350 degrees. Toss parsnips with oil, salt and pepper. Roast parsnips untilsoft, about 25 minutes. Sauté the remaining vegetables and thyme in oil until translucent. You do not want them to brown. Add LeGoût® Cream Soup Base, parsnips, and Knorr® Ultimate Chicken Base and cook for 10 minutes. Remove from heat and puree. Season to taste. Sauté the chorizo in a non stick pan and crumble with a spoon. Remove chorizo with a slotted spoon and retain the fat in the pan. Over the heat in the same pan toss the panko and toast until golden brown. Toss with chorizo and add fresh thyme, chives and shallots, and Dijon mustard. Season to taste and reserve at room temperature. 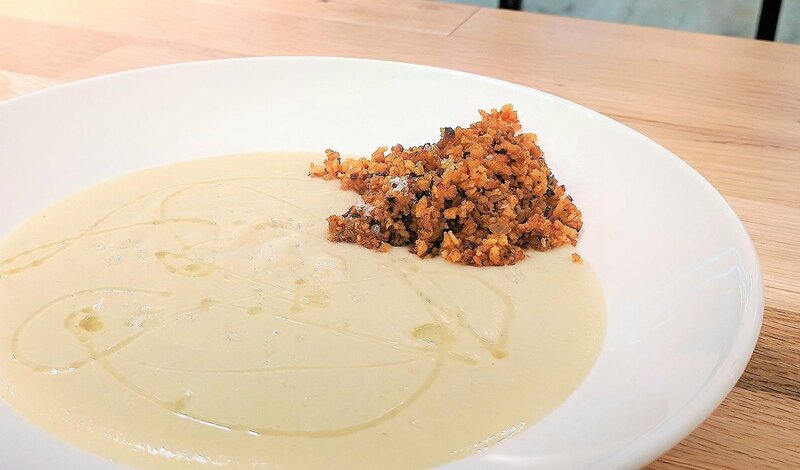 Portion the soup into bowls and top with chorizo crumble.